Good quality and large skirt. Good quality and deep fitting. Lovely fit with a fantastic stretchy skirt. No rustle and to top it off, it doesn't ruck up underneath when trying to fit a flat sheet - brilliant. Excellent quality. Best we have ever come across. Doubt guests will realise these are waterproof. We now have these in single and super king sizes and they are excellent. I found this protector rustled and felt like plastic on the back. I was anxious guests would feel it uncomfortable despite the nice quilted top. I use these to protect the mattress and under the topper. Great product. The product is exactly as described. No leakage whatsoever and it was well tested by the grandchildren!!! It is soft to lie on and no crinkling. A little bit longer to dry than other less quilted products so I bought 2 so we always had a spare for the next night. Brilliant! Very pleased with this product. Good value for money and plenty big enough to place easily on the super king sized bed. This waterproof protector fits really nicely on the bed, and much better quality than the one I took off...going to order replacements for our the beds. Good value, which is why I keep buying them. Perfect, just what we were looking for, a totally waterproof (we hope! ), non crinkly mattress protector. Great product. 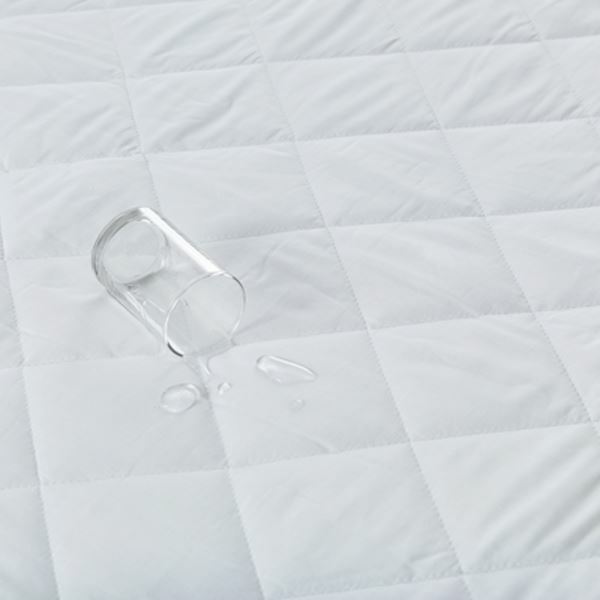 Perfect for protecting the mattress without the plastic rustle! This is a high quality product and feels soft to sleep on - would buy again. Good quality, long lasting. Deep skirt.